Hockley Heath Academy principal, Roulla Gabriel, welcomes Paul Sturgess to the school. Picture by Hockley Heath Academy. BRITAIN’S tallest man and ex-Harlem Globetrotter player Paul Sturgess inspired Solihull students to aim high in a recent visit. Pupils at Hockley Heath Academy were told what life was like for him growing up and his career including four years on the American team from 2011 to 2015. 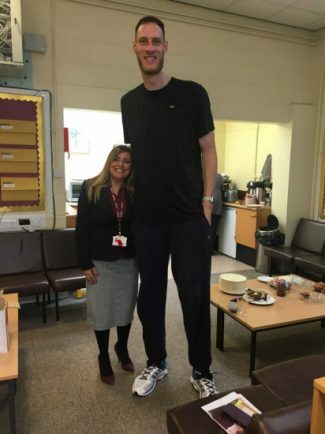 Loughborough-born Paul, who holds the Guinness World Record for Britain’s tallest man at 7ft 7inches (2.32m), then led a basketball workshop where he taught the children skills and tricks.